What Website Designs Trends to Expect in 2015? We have already witnessed the emergence of some unique and fascinating web design trends in 2014 like parallax design, flat design, single page websites and more. Though, some of the trends may fade out with the passage of time, some are expected to stay on and move towards further betterment and advancement. With newer devices being offered by companies every now and then, website designers are required to constantly adapt to the dynamic changes that are taking place. 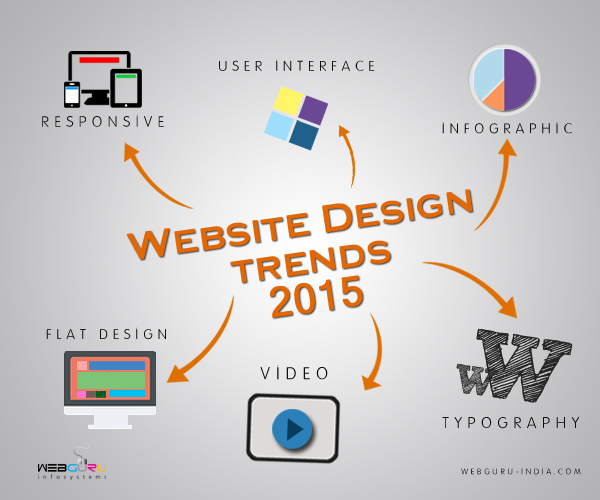 Here’s a look at some of the website design trends that are expected to make a significant impact in the year 2015. There is a high possibility that the number of people surfing the web on mobile devices will outnumber the number of people browsing the web on computers or laptops in the year 2015. Thus, responsive website design is expected to gain more popularity in the year 2015. Web designers need to focus more on how to enhance the experience of the users across devices of different screens and resolutions. In fact, responsive web design is no longer a part of the trend as it has become a necessity for a seamless web experience in the present day world. Over the past couple of years flat design has been the choice of designers and users alike. The best part about flat web design is that, it allows users to concentrate on the main content of the website without any sort of distractions as well as be part of a wonderful browsing experience. This helps to bring more appreciation to the content and actual purpose of the website. The flat web design trend will no doubt evolve further in the year 2015 adding to the overall experience of web users. The minimalist yet attractive look of flat design easily scores over other design options. Infographics have certainly changed the way information is offered to the audience. The formidable combination of information along with graphics not only makes information easy to digest but, increase chances of user engagement. One can expect to see infographics in full bloom in the coming year where the viewers will be communicated the exact message but, in a precise and minimalist way through attractive graphics and short pieces of information. There have been some significant developments in typography over the past few years and in 2015, typography is expected to occupy the center stage. Advancements in responsive typography will continue allowing users to experience text on different devices in way that is similar to standard, larger desktops. With plenty of amazing quality fonts available at reasonable prices, designers will no longer feel the need to go for expensive fonts. Thus, web users can expect to see the arrival of high quality fonts that is only available to print mediums. Quality background images already made their presence felt in the year 2014. It is now time for storytelling videos to make their impact in the year 2015. Year 2015 will definitely witness the inception and rise of videos within the home page of different websites. With the help of these videos brands will be able to express more about their mottos and objectives to the target audience. The popularity of scrolling is mainly contributed to the huge success of mobile devices. Not only it is easier and convenient for the users but, also cuts down load times. As already stated, year 2015 will bring in more advanced mobile devices and with that, internet browsing, ecommerce shopping, etc. from mobile devices will increase. Long scrolling pages along with parallax design will bring in some really interesting websites that would be fun and easy to navigate. It is quite evident that 2015 will be a year where some of the website design trends that we witnessed in 2014 will come back in a more advanced and matured way. The design trends which have been mentioned here are slowly beginning to be accepted widely by web designers from various parts of the world. Though, accepting some of the new trends may not be as easy as it sounds but there’s always room for improvement and betterment. If you have any further suggestions or questions related to this blog, please do feel free to put down your opinions within the comment section of the blog and we will be more than happy to answer you. Being a web designer, going this blog has helped me immensely in increasing my knowledge of the design trends in this brand new year. The information shared in this blog will help me in my future designing endeavors.